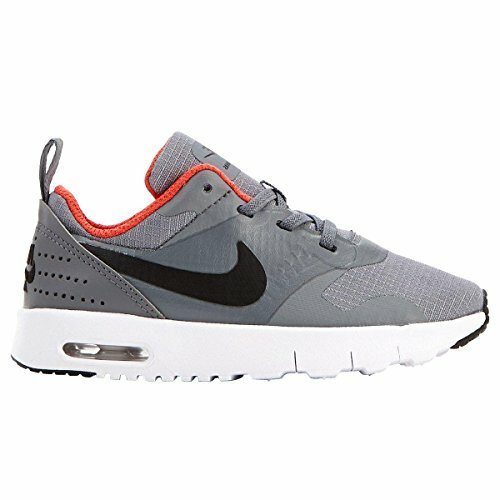 The grey and white Nike Air Max Tavas Juniors' lace up trainers take comfort to the next level. These casual trainers offer springy cushioning and lightweight support to stay quick and comfortable at school or at play. The textile upper's sleek and modern no-sew synthetic overlay design provides breathability and great comfort. Lasting impact protection is provided by the Max Air unit during intense play. The trainer's Phylon midsole is resilient and flexible. A waffle inspired synthetic sole with rubber placed at the front and back of the shoes add durable traction on any surface. Textile fabric lining and removable insole provide healthy inner climate and all day comfort.